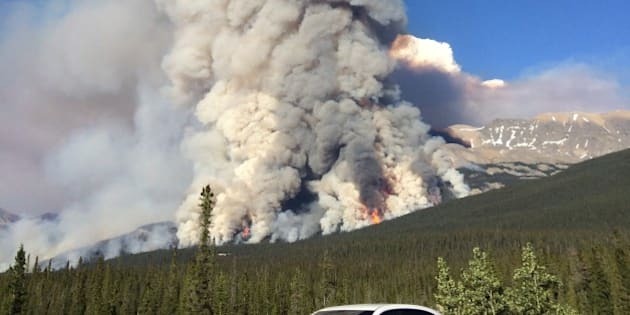 The number of wildfires in Canada's national parks was close to average last summer, but the size of some of those fires made it an unusually hot season. "We've had a more active than normal wildfire season," said Jeff Weir, Parks Canada's national fire manager. "A small number of those fires have been quite challenging." The agency reported 85 wildfires in the spring and summer of this year. That's slightly higher than the average of 82. The amount of forest burned was almost 3,000 square kilometres — an area about half the size of Prince Edward Island. "That's higher than normal," Weir said. There were several large fires in Wood Buffalo National Park, which straddles the boundary between northern Alberta and the Northwest Territories. Together with a large fire in Banff National Park, the fires accounted for 1,300 square kilometres of forest burned. "Wood Buffalo has proven challenging for the last two or three years," Weir said. "It's been a prolonged period of drought they've been experiencing. There's probably been the same number of fires, but they've got more potential to grow because the fuel's been so dry." Wood Buffalo, Canada's largest national park, is drained by the Peace and Athabasca rivers. Scientists have said that region has been drying out for a long time because of climate change and the effect of upstream dams in British Columbia. Weir said Parks Canada was also busy with and successful in setting its own fires. The prescribed burns are done to restore health and balance in forest ecosystems. Foresters burned 40 square kilometres of forest at 12 different parks, including well-known destinations such as Thousand Islands in Ontario. Another 23 such burns at nine parks are still planned for the fall. "Prescribed burning to improve the health of park ecosystems is currently being done across Canada," Weir said. "You'll see continued emphasis by Parks Canada to undertake prescribed burns." The approach is often needed to preserve species that depend on fire for part of their life cycle. At Thousand Islands, a burn was undertaken to preserve the pitch pine. The tree can easily resprout even after its main trunk is scorched, but without occasional fires its saplings can be crowded out by shrubby undergrowth. "They're very happy with the way (that burn) went." Parks Canada began setting prescribed burns about 30 years ago, said Weir. The technique was pioneered in the western parks and is now being used more further east. Weir said the public was originally baffled as to why an agency charged with preserving parks was setting parts of them on fire. But people are catching on to why it's done, he said. "The last 30 years of action and communication has significantly increased the public's understanding and awareness. "At the same time, our Canadian public is changing, our demographics are changing, and in order to ensure this work is sustainable, we have to ensure that people understand what we're doing and why we're doing this."